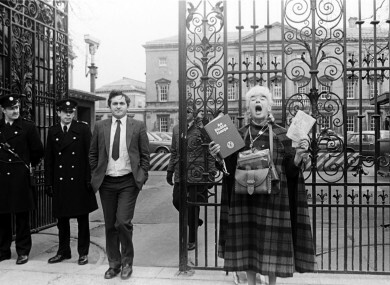 Bertie Ahern, then Chief Whip of Fianna Fáil outside Leinster House, as former school teacher Margaret dances in honour of the Holy Trinity and Virgin Mary. FILTERING THROUGH THE thousands of memos, letters, speeches and notes held in the Taoiseach’s Department from 1983, it is easy to discern what was the biggest issue for Irish people at the time. Although the phone tapping scandal, economic troubles, the IRA hunger strikers and a growing drugs problem in the capital all captured the public’s attention, nothing divided people’s opinion in the same way as the freshly-ignited debate on Ireland’s laws prohibiting abortion. An extremely strong campaign had emerged early in the 1980s to lobby the government to introduce a ‘Pro-Life amendment’. The move came in the wake of the Roe versus Wade verdict in the US Supreme Court which allowed for the introduction of less restrictive regimes. There was genuine fear in Ireland that the courts could do something similar here unless a Constitutional provision prohibiting abortion was introduced. On winning the November 1982 election, Garret Fitzgerald promised to follow through with the plan to insert the clause into the Constitution. In its Programme for Government, Fine Gael and Labour agreed to allow a free vote in the Dáil. Even with that decision, the issue was never straightforward. There were disagreements about the wording of the insertion, leading to the Fine Gael-Labour coalition losing that vital vote in Leinster House. So, instead of the government’s alternative wording, the initial Fianna Fáil amendment was put to the people on 7 September. Before then, however, the Taoiseach was inundated with opinion from various lobby groups, churches and lay people. According to an internal memo between two officials in the department, the correspondence to the Taoiseach was divided but not in “as clear-cut” a way as they first appeared. “People object or agree to the amendment for different reasons and they also propose different solutions,” says the document. It gives a brief summary of what both the pro-amendment and anti-amendment sentiment was at the time. The Catholic hierarchy supported the original wording, while many of the other churches in the land disagreed for various reasons. Before the last election you were in favour of the amendment. How can you change your mind at this stage? How can anyone in their sane mind consider it sectarian? Must the majority in the South always bow to minority opinions? Why the lack of legal interest since the election? I should feel very concerned that your positive statement on this serious matter was just an election gimmick – you cannot have made it without deep consideration and lengthy discussions? This amendment is absolutely necessary at this time. It should not be postponed. The majority of Irish people do not want abortion, so that can speak for the nation. Honour your commitment and do not meddle with the wording. All I want is the right to vote per your pre-election commitment. Your party does not speak with one voice but with many voices. The wording of the amendment need have nothing complex or legal in it at all. All it need say is that the unborn are treated equally with the born. On the other side, those opposed to the amendment spoke about ‘more pressing issues’ such as removing the ‘illegitimacy’ label and allowing adoption for those born to “inadequate parents”. There was also a number of the opinion that there was no urgent need to push through the amendment and that, even if it was, thousands of women would continue to “go to England each year for abortions”. Many sections of the Protestant community were against the amendment, with the Dean of St Patrick’s telling the Taoiseach that the Constitution should “steer clear of controversial and moral questions”. “This amendment will encourage all the ills and will do no good and will encourage every nutty group to narrow our freedoms even more,” he continued. Having trouble viewing the image? Click here. Nothing in this Constitution shall be invoked to invalidate, or to deprive of force or effect, any provision of a law on the ground that it prohibits abortion. - was not looked upon favourably by any church operating in Ireland. The fresh amendment sought to ensure that the legislation prohibiting abortion – the Offences Against the Person Act, 1861 – could not be deemed unconstitutional by the courts. In a letter to the Pro-Life Campaign, Fitzgerald said it was arrived at after an “agonising six weeks trying to square the circle”. He explained that the alternatives considered by his party would be open to interpretation by the Supreme Court which would undermine the purpose of the amendment – that is “to ensure that the Supreme Court could not legalise abortion over the heads of the Oireachtas and against the wishes of the people”. The Taoiseach was clear that “every member” of his party was “personally committed to prevent the introduction of abortion”. Justice Minister Michael Noonan moved the new amendment in April 1983. Despite Fine Gael’s protestations, the alternative wording was criticised strongly with Fianna Fáil arguing that it would not protect the constitutional right to life of the mother. The amendment was defeated by 87 votes to 65 in the Dáil and the original version put to referendum. In an unusual turn of events, Garret Fitzgerald then campaigned against the amendment. It is still a rare case of a non-government amendment being put to referendum. A book published by the Family Life Research Centre at the Knock Shrine in Mayo centres on the ‘Abortion Truck’ arriving in Ireland. Some of the literature sent to politicians of the day give an idea of the extremities lobby groups could go to get their views seen and heard. 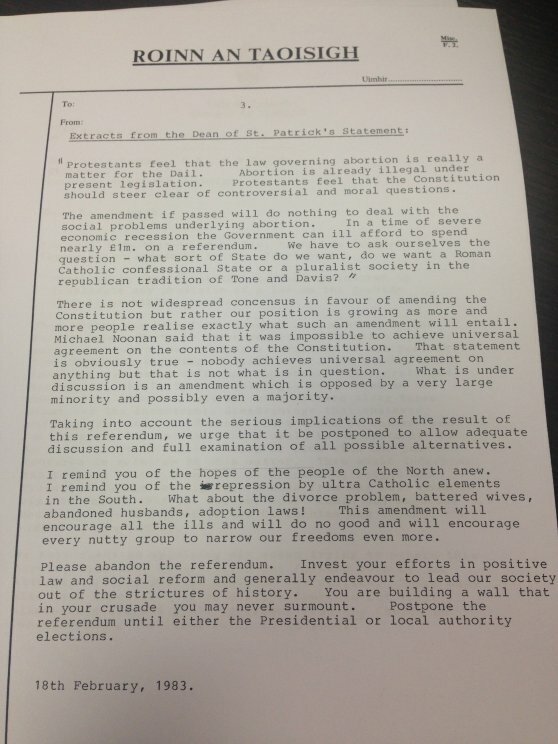 In a February 1982 letter to the Taoiseach’s adviser, barrister Frank Callanan (who was widely tipped to be named Attorney General in 2011 but missed out to Máire Whelan), suggested that Fitzgerald should make a speech which contained an “express attack on extreme advocates of the amendment who have used the issue to divide confuse and embitter opinion in the country”. The following year, the adviser wrote back to confirm that the Taoiseach had considered a speech to highlight his regret that the whole issue had turned into a party political one. A draft address kept in the department does criticise “extreme pressure groups” (not the Pro-Life Amendment Campaign). “There will always in any society be people with fanatical views willing to lend themselves to campaigns of defamation against those who do not fall into line with them in their more extreme demands – campaigns of defamation such as in this instance were directed in writing against a member of my party in leaflets handed out at our Ard Fheis, and verbally, by whispering and innuendo, throughout the county against myself in the weeks and months before this issue came to a head,” it reads. Politicians have to live with this kind of treatment and if they have not got hides tough enough to stand it, they would be better off outside politics. But the political system itself becomes vulnerable when political parties themselves stoop to take advantage of the emotions aroused by such fanaticism, distorting the democratic process by doing so. The Taoiseach noted that the public had been confused by the issue at hand because it was quite extraordinarily complex. That was not helped, he added, by the passions aroused on both sides or by the extent to which it had “regrettably come to be politicised”. After almost three years of campaigning, protesting, rallies and vigils, the Pro-Life Amendment – as originally envisaged by Fianna Fáil in the early 1980s – was put to referendum and passed on 7 September 1983 with a 67 per cent majority. It was signed into law just one month later. Three decades later, Irish people continue to debate its merits and pitfalls and there are plans for a campaign next year to repeal the amendment to allow for less restrictive rules here. The Protection of Life During Pregnancy Act, which was voted through earlier this year but has yet to commence, will legislate for the decision in the X Case where the Supreme Court allowed for abortion in the case of a woman’s life being at risk of suicide. Email “History lesson: What happened during the 1983 abortion referendum?”. Feedback on “History lesson: What happened during the 1983 abortion referendum?”.